NABE Midyear Meeting Handouts - Be sure to check this site often. Handouts may be added up to and even after the meeting. This year's meeting theme was Winning Hands: Leadership, Growth & Inclusion in 21st Century Bars. Follow this link to view the program. 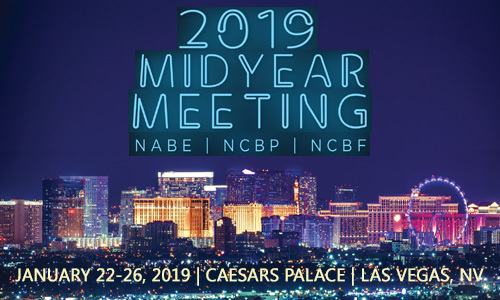 The 2019 NABE Midyear Meeting began on Tuesday afternoon, January 22, 2019 and ended after lunch on Thursday, January 24, 2019. The 2019 Administration & Finance Section Workshop was held immediately prior to the Midyear Meeting at Caesars Palace with programming in the afternoon on Tuesday, January 22. Hotel Information: The NABE 2019 Midyear Meeting headquarters hotel was Caesars Palace, 3570 S Las Vegas Blvd., Las Vegas, NV 89109. All NABE business meetings, programming, and events took place at Caesars Palace unless otherwise noted in the program/agenda. Travel Planning: Visit Las Vegas to plan your trip. Transportation: Las Vegas is served by McCarran International Airport. Once on land, follow this link to find Taxi, Shuttle, and Public Transportation information. Weather: The average high temperature in Las Vegas in January is 58°F (14°C). The average low is 39°F (4°C).